Submit the number of stars for your review and be sure to fill out the “What do you think about this place?” section. You can even decide who can see this review! You can mark it as public, or choose to share it with friends…you can even create a custom review. 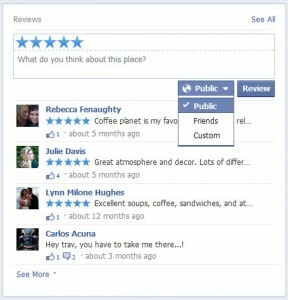 IF you have a physical address on your Facebook page, the review option is automatically enabled! The only way you can remove the review option is to remove your physical address from your page. You can NOT remove individual reviews. Good idea? Bad idea? If you are a company who has spent a lot of time, effort and money to provide excellent customer service and received good local reviews and lots of Facebook likes, is it possible one bad review from a random person could affect all of your hard work? We want to hear from you – what do you think Facebook starred reviews could mean to the future of this social media platform…and your business.